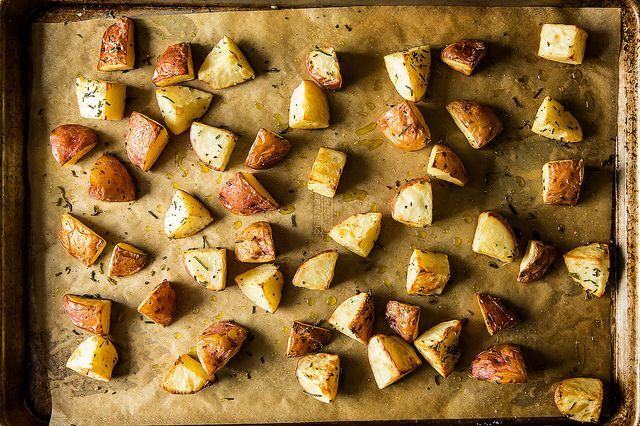 Today: The 4 steps to roasting any vegetable, no matter the season. Roasting vegetables is a simple pleasure. Chop and dress them, throw them in the oven, shake the pan a few times, and you've got caramelized, soft-yet-crispy bites ready to complement any meal, from roast chicken to salad. They're almost too simple for a recipe -- and once you're comfortable with the technique, they're practically impossible to mess up. 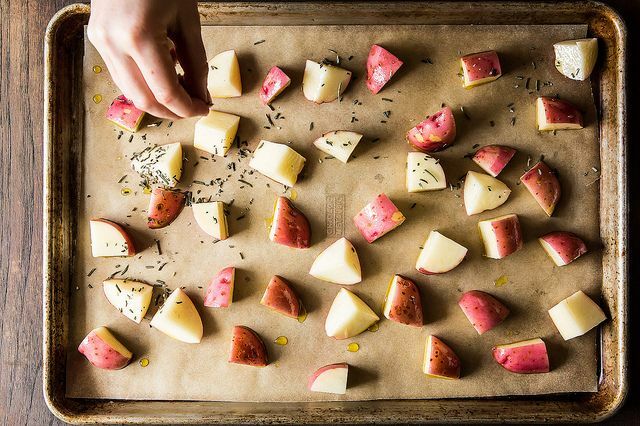 From winter to spring to fall, most of our favorite vegetables -- potatoes, asparagus, squash, radishes -- can be dressed up by just a hot oven, a drizzle of oil and a sprinkle of salt. Commit these easy steps to memory, and you'll be roasting everything in sight. 1. Wash your vegetables and pat them dry. Cut into uniform pieces, or leave them whole if they're small and you're lazy. 2. Drizzle with oil. Sprinkle liberally with salt. Add herbs and spices in any combination you fancy. Stir it all around with your hands, making sure to coat each piece. 3. 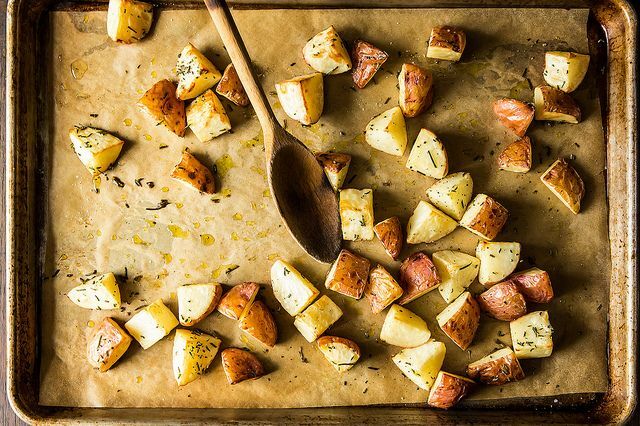 Send your veggies into the oven on a parchment-lined pan. Roast somewhere between 400 and 450 degrees. Part way though cooking, flip your vegetables -- or at least stir and shake. 4. Your vegetables are done when crispy on the outside and soft on the inside -- they will easily give way to a knife or fork. Hardy root vegetables cut into 1 1/2 in cubes will take roughly 45 minutes at 400 degrees. Serve at any temperature you like; leftovers keep well in the fridge. You can even roast your fruit. Start with rhubarb. The author of the The Food Lab suggests with potatoes you should parboil them for 10 minutes first. THEN dress them with oil and spices and bake. 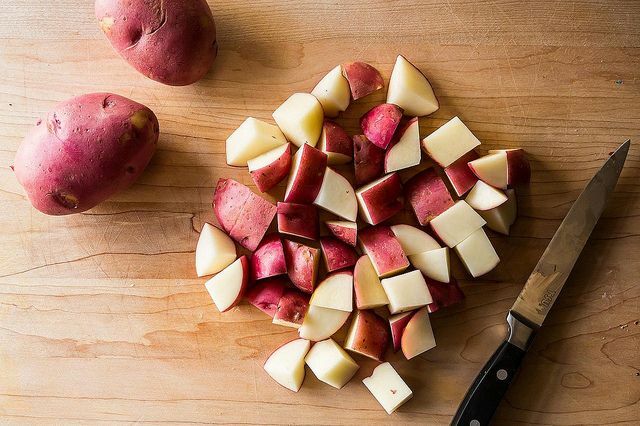 This combination allows the potatoes to get super crunchy on the outside instead of papery. I tried it and it works! Every Sunday I like to roast whatever vegetable is in season. That way I have a bunch on hand to snack on or throw into my brown bag salads. Hurrah! 1. I toss my veggies, seasonings and EVOO into a large ziploc, shake vigorously, then pour into roasting pan. 2. This is really important - make sure the roasting pan is large enough so that all your veggies are in ONE LAYER, with a bit of room to breathe - otherwise the veggies steam instead of roast and you will never get them crisp. For some vegetables like brussels sprouts and broccoli that can be tough after roasting, I add couple of tablespoons of water to the pan to help them steam a bit first. I agree with BronaCos. I toss my veggies with a bit of EVOO and the seasonings before I put them on the pan. Having one of those Misto oil spritzers also comes in handy to add a bit of oil during the roasting process. Thank you! sometimes it is very helpful to have even the simplest of things explained. i will be roasting vegetables every day now! The fourth step is labeled as "5." King Arthur Flour has parchment in a box, just the size for a half sheet pan. You could also get a silpat and use it only for veggies. 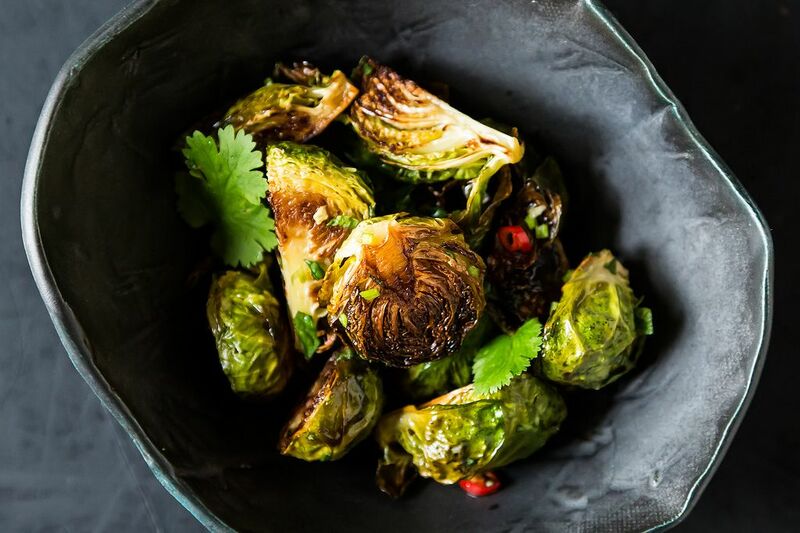 This is a time for a good convection oven - you can roast just about any vegetable that is roughly 1 - 1.5 inches in diameter in 15 - 20 minutes to be beautifully browned and perfect texture. I also do not use parchment and find the pan comes clean with a short soak. I just hate throwing out paper after one use. We roast all the time and our dedicated roaster pan isn't that hard to wash after a short soak. Roasted vegetables are the best! Aluminum foil works well too, if you don't have the parchment. I prefer to toss my veggies in a bowl with a little oil and selected seasonings before spreading them out on lined baking tray - this ensures all are evenly coated. Yes it's an extra bowl to wash but in my mind worth the effort. What's not to love about roasted vegetables?!?! What's the source of the parchment paper in these photos? I've been looking for sheet pan size pieces of flat parchment. We just cut them with scissors! When I use sheets of parchment, I often have to cut them down anyways, as they're not standard baking sheet-sized. I buy my parchment from Cash & Carry (aka Smart & Final) in a flat box of full-sheet size papers. My pans are half-sheet size so I grab a small supply, cut them in half, and store in my drawer for use. I bought a big box of 1/2 sheet parchment liners at a restaurant supply store - it should last me years. Is the purpose of the parchment just to save having to wash the dishes? I always thought that the vegetables wouldn't brown as well with parchment, but I've never actually done a side-by-side comparison. 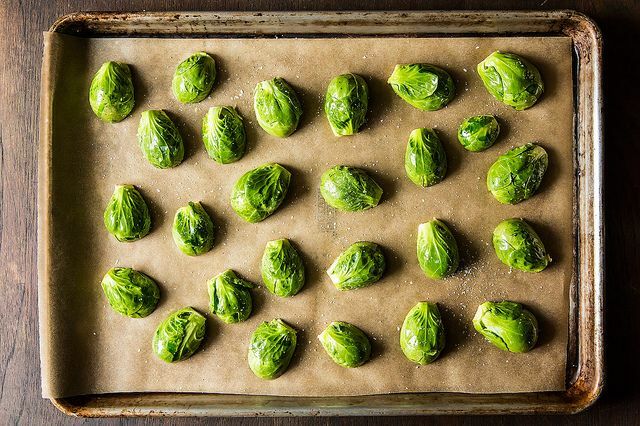 I use parchment for ease of cleaning; even with something like brussels sprouts, which you want a good char on (or at least I do! ), parchment still works well. And less scrubbing is always a good thing. It also helps with sticking! Not much of an issue for brussels, but potatoes can be stubborn. having tested parchment with cookies, I think you a right linzarella - if you want soft bottomed cookies, use parchment - if you want crisper, use bare pan or foil. that said, higher temps for roasting veggies may produce different results!